Could the incentivizing power of a fitness tracker be adapted to help achieve gender equality in the media, enhancing Canadian democracy in the process? After a year of collaboration with a team of big data scientists, we’re about to find out. Despite the increasing attention paid to the importance of women’s voices, in news media coverage — both in Canada and around the world — male perspectives continue to dominate by a ratio of more than two or three to one. In the days when few women earned graduate degrees, led organizations or were elected to public office, that dominance was understandable. But today? Not so much. The disparity in representation now makes headlines. In 2012, the BBC convened an all – male panel to discuss breast cancer and teen contraception. The outrage was as swift as it was predictable. But humiliation can sometimes be a galvanizing force: Britain’s national broadcaster has since offered hundreds of expert women free media interview skills training. And last year, it explicitly committed to meeting a 50:50 challenge, aiming to ensure the equitable representation of male and female sources by 2020. Some programs have already achieved the milestone two years ahead of schedule. In fact, doing so isn’t that difficult. Matthieu Dugal, host of Radio Canada’s La Sphere, reported more than two years ago that his program had featured as many female guests as male — despite its focus on technology. Similarly, Bloomberg has been actively seeking gender balance among its business news sources for several years. In an age of the perpetual news cycle, when many reporters, editors and producers are doing the job of three people, we understand why this might be unappealing. But there are upsides to the vaccination discipline. La Sphere’s gender parity achievement was accompanied by an increase in the program’s audience share. And The Financial Times recently discovered that reframing one of its electronic newsletters to actively engage female readers inspired higher open rates in male readers as well. Given social media’s disruption of newsgathering revenue models and the need to sustain trust among news consumers, all news organizations should be paying attention to these experiments. Indeed, a collaboration between the World Economic Forum and Internews, a U.S.-based global non-profit, is explicitly aimed at ensuring more women’s voices are included in news coverage, in pursuit of increasing community trust in news. That’s why Informed Opinions has been working with researchers at Simon Fraser University to put big data to work in the service of democracy. Over the past year, we’ve built the Gender Gap Tracker, an online digital tool that monitors the ratio of male to female sources quoted in Canada’s most influential news media. It features easy-to-read graphs updated on a daily basis reflecting both the performance of individual newsrooms, and the aggregate ratio of them all. The tool captures only the sources cited on each news outlet’s website; it’s unable to quantify those who might appear in broadcast interviews, but aren’t referenced online. Yet so far, its results mirror the ratios found in previous research done manually. 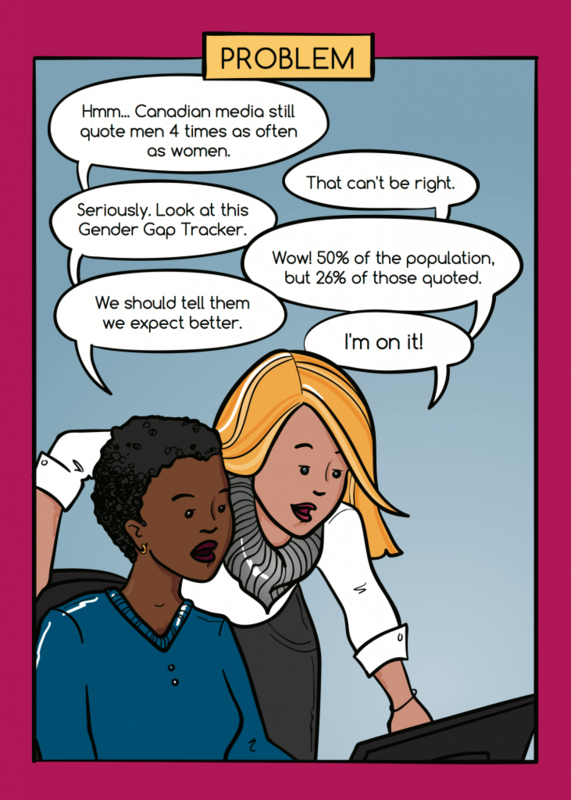 The goal of the Gender Gap Tracker is to celebrate news organizations that lead by example, and motivate those who lag behind. And it offers news consumers and media organizations alike a daily reminder of the remaining gap. Improving this metric is important for all of us. Good journalism is fundamental to democracy, and the persistent underrepresentation of women’s perspectives denies Canada access to the analysis and ideas of many of its best and brightest. It also undermines policy decisions. Many issues affect women differently; solving complex social, economic and environmental problems requires us to more equitably integrate their experiences and insights. Diverse, qualified women exist in virtually every field, and for the past nine years, Informed Opinions has been motivating and delivering media skills training to thousands of them across the country. Our free online database of diverse experts committed to responding to interview requests quickly now features more than 800 female sources.